648 min. AMC. Cast: Kim Dickens, Cliff Curtis, Frank Dillane, Ruben Blades. Civilization hobbles along on its last legs on AMC's Fear the Walking Dead. The show's second season improves the spinoff (from more famous elder sibling The Walking Dead) in just about every respect, but in taking its cues from the mothership, Fear the Walking Dead gets the best and worst of its more popular counterpart, while reminding the viewer that, no matter how good Fear the Walking Dead gets, it'll never be allowed to scoop the original show with a consequential plot point: if a major revelation drops about the infection, you won't hear it here first. And so Fear the Walking Dead will have to settle for doing what it's allowed to do as well as it's allowed to do it. In Season Two, this means putting its cast into genuine jeopardy (some of the best characters bite it, so to speak) and developing both new locales to hunker down from the Dead and new ways for the Dead to trap the living in nailbiting situations. Picking up where the initial season left off, the second season begins on the Abigail, a ship that escapes and heads south just as southern California goes up in flames f napalm. On board are the show's central couple of Madison Clark (Kim Dickens) and Travis Manawa (Cliff Curtis), their mixed family of Travis's son Chris (Lorenzo James Henrie) and Madison's son Nick (Frank Dillane) and daughter Alicia (Alycia Debnam-Carey), Daniel Salazar (Rubén Blades) and his daughter Ofelia (Mercedes Mason), and the ship's mysterious master Victor Strand (Colman Domingo). The characters' adventures in survival will eventually bring them into contact with an island-wrecked airplane hull, a Mexican "colonia," and the high-rise Rosarito Beach Hotel. Like The Walking Dead, Fear the Walking Dead creates drama by separating and reuniting its characters. Every episode serves up at least some fight-or-flight survival moments and zombie gore, but executive producer Dave Erickson and his team devote much of Season Two to the kind of psyhological and philosophical questions The Walking Dead is also known for noodling in. Happily, the spinoff finds some interesting territory to explore beyond the usual post-apocalyptic hope-versus-despair dichotomy about the future, if any, of the world. More than anything, the second season is about psychological damage, but in more of a real-world milieu than the more iconic but more comic-booky mothership. Here, stresses and strains and fissures crack wide open for multiple characters, forcing interesting quandaries and choices. What if a loved one turned out to be a bad person, morally speaking? How would you react, and how far would your responsibility to that person go? How do you choose between loved ones, when push comes to shove? What turns a good person bad, and can bad people ever truly redeem themselves? In a mad world, where does sanity begin and end? And in a world where survival is job one, how relevant—or relative—is morality? As long as the show continues to spin out these questions, there's just enough gristle to chew on for actors of the caliber of Dickens, Curtis, and Blades (as well as guest stars like Dougray Scott). Certainly, both Walking Dead shows have their dark beauty, darker horror, and squirm and splatter effects down to a science. If Fear the Walking Dead can't entirely escape its formula, it's doing its own admirable job of survival, with a few casualties along the way. Anchor Bay Entertainment continues its commitment to the Walking Dead franchise on Blu-ray with Fear the Walking Dead: The Complete Second Season on Blu-ray + Digital HD. The picture quality for this show has shifted from a 16mm source to a digital one that resembles the same aesthetic while offering more detail. It's a faithful image, but also one that tends to a dim, shadowy, sickly hued look that's the opposite of what people generally associate with hi-def. Rest assured, though, that the show looks its best here, in a hi-def picture that bests its broadcast counterpart. Detail and textures bolster the sense of resolution, and color gets a nuanced treatment. Each of the fifteen episodes gets a lossless Dolby TrueHD 5.1 mix that powerfully puts forward the original sound mixes for maximum fidelity and discrete separation and placement of effects, music, and dialogue in the surround-soundfield. Disc One's audio commentaries include "Monster" and "We All Fall Down" with co-creator/executive producer Dave Erickson and Kim Dickens, "Ouroboros" with writer/producer Alan Page and Cliff Curtis, and "Blood in the Streets" with writer Kate Erickson and Colman Domingo. Disc Two holds audio commentaries for "Captive" with executive Producer David Alpert and writer Carla Ching, "Sicut Cervus" with Alpert, "Shiva" with Erickson and Rubén Blades. Disc Five houses "Deleted Scenes" (8:13 with "Play All" option, HD), the "Flight 462 Webisodes" (14:34 with "Play All" option, HD), and the fantastic "Q&A with Cast and Creative Team from Paleyfest LA 2016" (54:29, HD) Colman Domingo, Lorenzo James Henrie, Mercedes Mason, Rubén Blades, Alycia Debnam-Carey, Frank Dillane, Cliff Curtis, Kim Dickens, executive producer Gale Anne Hurd, and creator Dave Erickson recorded March 19, 2016, a few weeks before the second season began airing. 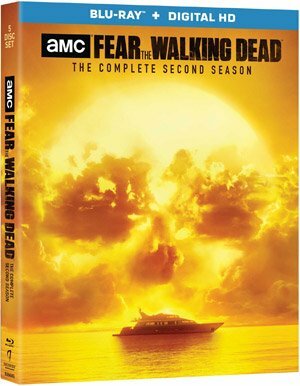 Also on Disc Five are two sets of promos that correspond with each of the episodes of Season Two: fifteen installments of "Inside Fear the Walking Dead" (HD) and fifteen installments of "The Making of Fear the Walking Dead" (HD). The former focus on character and the latter on production techniques; all feature cast and crew interviews, clips, and behind-the-scenes footage. All site content © 2000-2019 Peter Canavese. Page generated at 04/20/2019 02:16:52PM.